Leo Durocher (right) and Casey Stengel before the start of the opening game of the 1951 World Series at Yankee Stadium. 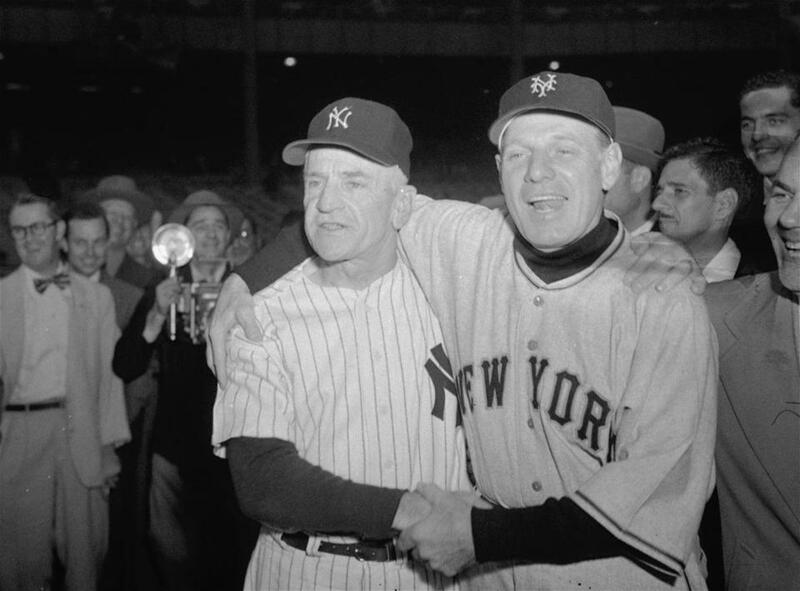 In a time when America was obsessed with three sports — baseball, boxing and horse racing — everyone knew this pair by their nicknames: “The Old Perfesser’’ and “The Lip.’’ Casey Stengel and Leo Durocher. For half a century they were the national pastime’s most colorful and enduring characters, the game’s most beloved (Stengel) and most despised (Durocher), both destined for the Hall of Fame. Both were amply chronicled during and after their days in uniform with Durocher producing two autobiographies (“The Dodgers and Me’’ and the more characteristically titled “Nice Guys Finish Last’’). But in the decades since they left the stage two generations have grown up, and the digital age has enabled new biographers to mine an exhaustive range of sources, particularly about their subjects’ playing days, and to put their careers into broader context. Marty Appel, a former Yankee publicist whose previous volumes include “Pinstripe Empire,’’ offers an affectionate and anecdotal chronicle of the playing and coaching days of Stengel, who presided over the final stretch of the sport’s greatest dynasty, which produced 10 pennants and seven World Series titles. Charles Dillon Stengel (his nickname came from his Kansas City, Mo., birthplace) was a dental-school dropout whose first professional club, the Kankakee Kays, played across from the Illinois state mental hospital and were known as the Lunatics. He went on to perform for five of the eight clubs in the National League, most notably the Dodgers, and developed a reputation as a buffoon, thumbing his nose at the Yankees while circling the bases after a home run in the 1923 Series. Amid heckling when he returned to Brooklyn as a Pirate Stengel doffed his cap to the fans, releasing a sparrow. After retiring as a player in 1925 Stengel managed a series of second-division clubs, including the Boston Braves. After his right leg was shattered by an automobile while he was crossing Commonwealth Avenue on a rainy night, sports columnist Dave Egan nominated the driver as “the man who had done the most for baseball in Boston in 1943’’ for sidelining the skipper of the sagging club. Essex House on Central Park South, and stayed for a dozen years. With the notable exception of Joe DiMaggio his players admired his savvy even as they struggled to decipher “Stengelese,’’ his loopy loquacity that later confounded Congress during a 1958 hearing on baseball’s antitrust exemption. “Sometimes I get a little hard-of-speaking,” Stengel admitted. After the Yankees dismissed him after a seventh-game loss to Pittsburgh in the 1960 Series (“I’ll never make the mistake of being 70 again.’’), the expansion Mets picked him up two years later, hoping Stengel’s volubility would distract attention from a worst-ever team on the field. “You look up and down the bench and you have to say to yourself, ‘Can’t anybody here play this game?’ ” Stengel is said to have observed as his collection of “amazin’ ’’ castoffs lost a record 100 games. Paul Dickson, whose resume includes a biography of baseball maverick Bill Veeck, pens an absorbing account of Durocher, a pugnacious provocateur who went through four wives (including actress Laraine Day), shot pool, hobnobbed with gangsters, gamblers and entertainers and was a master of wearing out welcomes while continuing to receive invitations from clubs that needed a firebrand. Like Appel, Dickson spends the vast majority of his book on Durocher’s professional life, briskly moving though his birth and hardscrabble upbringing in West Springfield (a childhood hero was “Springfield neighbor Walter ‘Rabbit’ Maranville’’), leaving high school sans diploma and launching his career as a player in nearby Hartford. Durocher scuffled with teammate Babe Ruth, whom he dubbed “Dummy’’ and once brawled with Stengel. “I will see you later, punk, under the stands,” Stengel shouted when his Dodgers were playing Durocher’s Cardinals in 1936. “You and what football team?” Durocher countered. Stengel conked Durocher on the knee (“my famous fishhook punch’’), either with a fist or a bat. “Two feet closer and there might not of been no more Durocher,” he said later. Durocher, who survived battles with rivals, umpires, and commissioners, was baseball’s Zelig, Dickson observes, popping up amid the game’s most memorable moments. He played alongside the “Murderers’ Row’’ on the 1928 Yankees, captained the Cardinals’ notorious “Gashouse Gang’’ in 1934, and managed the Giants during their 1951 miracle pennant and the Cubs during their epic 1969 collapse. “I could have dressed nine broads as ballplayers and they would have beaten the Cubs,” he declared.